What a wonderful time we all enjoyed! The fellowship was just so amazing! Last Monday, April 11, 2016, the Historical Marker was officially installed that celebrates the importance of the DeWitty African-American Settlement in a ceremony attended by close to 200 people. DeWitty was the longest lasting African-American, most successful rural settlement in all of, Nebraska. Parked cars lined the side of the highway. Elementary and college students stood with bright eyes filled with interest and wonder. Many traveled from the various Ranches of the surrounding areas including Brownlee, Seneca, and Thedford. Valentine residents also came to learn, share and enjoy the greatness of the occasion. This occasion was a culmination of a lot of research, phone calls, fundraising and reaching out to the families of the homesteaders and the Sand Hill communities. The great Ladies of Brownlee prepared a scrumptious midday meal to be enjoyed after the ceremony in the Brownlee Community Center. Sonny Hanna spearheaded a tour of the Sand Hills taking many of the descendants to the land their ancestors once made their homes and many were still interned there. Stew Magnuson, author of Hwy 83, “The Last American Highway”, was the master of ceremony and spearheaded The Descendants of DeWitty Team (Catherine Meehan Blount, Joyceann Gray, and Marcia Thompkins) in the making of this dream come to fruition. The great folks at the Cherry County Historical Society and the Nebraska State Historical Society quickly approved the application for the marker. And so it began, raising the money, buying plane tickets, gathering up old photographs as the excitement increased daily until 17 descendants came from all over the country to reconnect with a place that feels like home! They came representing the homesteaders who many traveled over 1700 miles from Canada and more from Kansas, Missouri, Tennessee, and Virginia to settle in the Sand Hills taking advantage of the Homesteader Act of 1862 and the amended Kinkaiders Act of 1904. What is so important about this community is the bond between African American homesteaders of DeWitty and their white counterparts in Brownlee. The two communities were very isolated back then and despite differences of heritage and beginnings, they enjoyed a civil and caring relationship that continues up to this day. “Something the rest of America should learn from” stated local resident Shelley Christiansen. Ron Lee also voiced his opinion: “As far as race relations…I will say this..there was not one single person there at that dedication ceremony who was anything different than anyone else. We were just all people celebrating a time in the past where everyone worked together, And, though we’re not neighbors now, land-wise or ownership of the land-wise, we’re still neighbors. Lyn & Bruce Messersmith, Bree & Martin DeNaeyer, Byron & Mary Eatinger,and Ann Manning-Warren to just name a few of who open wide the doors of hospitality. Lyn & Bruce Messersmith, Bree & Martin DeNaeyer, Byron & Mary Eatinger,and Ann Manning-Warren to just name a few of who open wide the doors of hospitality. In the audience were some students that were taught by Goldie Walker Hayes, a renown teacher throughout the area. She is our maternal grandmother. They expressed their fond memories and shared so many pleasing stories of her grace, beauty, teaching ability and her kindness. This was so heartfelt and enriching for us who lost her while we were just small children. Catherine, the granddaughter of Hester and Charles Meehan, spoke of the homesteaders struggles and delights and recited a poem her Dad wrote at age 17, speaking of an old footbridge across the North Loop River. William P. Walker’s burial plot in the Brownlee Cemetery. BackRow: Delbert DeWitty, (nephew of the Postmaster), Hershel Riley, Byron DeWitty, Artes Johnson& brother Maurice, (Grandson’s of Corena Walker- Williams) Garland Miles (Riley) Middle Row: Rev. Khadijah Matin, (Granddaughter of Roy and Goldie Hayes) Catherine Meehan-Blount, Jacob & Leah Ferrell, 3x Great grandchildren of William P. Walker, William Pegg, (Grandson of Roy and Goldie Hayes), Emerald Miles (Riley,) Phyllis Brown Denise Brown (descendants of Radford Speese, older brother of Charles Speese.) Joyceann Gray, (Hayes and Walker descendant). Seated front Row: Charlotte Woodson (Granddaughter of Charlotte Riley Walker) and her daughter Marcia Thompkins. And so we met back up at the Brownlee Community Center and ate a delicious meal and chatted and shared while Ann Manning-Warren gave us a trip down memory lane! They got it backward, but it worked. A group of Canadian-born Black families, former slaves, and their descendants came to a desolate and lonely region in the Nebraska Sandhills and built a community they called DeWitty, later renamed Audacious. Six hundred and forty acres seemed like a lot; surely enough to survive on, perhaps even prosper. Prosperity probably wasn’t a concept they dwelt on, so much as survival. That’s how it was in those days, and you didn’t have to be Black to know hard times in the hills. There were neighbors who understood that and welcomed them. The little town of Brownlee, a dozen or so miles downriver, had amenities that served the newcomers until they established businesses of their own, and interactions continued in the form of competitions at rodeos, baseball games and Independence Day celebrations. Brownlee had a community hall, and DeWitty had music makers, so there were dances too. DeWitty residents were strong for education, which eventually contributed to the demise of the community. Young people went away to college, became doctors, teachers, ministers, and writers and the elders finally drifted away too, but memories of those years lingered around Brownlee and became the legend as I was growing up nearby. My dad and his peers spoke names like Speese, Riley, Turner, Hayes, and Woodson, with admiration and respect. Stew Magnuson, an author with Sandhills roots, has traveled Highway 83 many times and chronicled the people and places along that route in a series of books. He became fascinated by stories about DeWitty, and recently spearheaded a project to raise funds for a historical marker about it. On April 11, 2016, nearly two hundred people gathered at the marker for a dedication. Descendants of DeWitty came from both coasts and everywhere in between, and my family was privileged to host several of them. Sandhillers traveled more than a hundred miles to honor our common roots, and the ladies of Brownlee and surrounding communities put on a “Y’all come” feed in that old community hall. The rancher who owns much of the ground where DeWitty stood organized a tour for those who cared to see where their ancestors had settled, and others uncovered buried grave markers in the Brownlee Cemetery for family members to photograph. As our guests departed for various destinations, they said the weekend had given them closure, and they felt like they had, in some sense, come home. I felt closer to my own family and more proud than ever of my heritage and neighbors. Many people snapped pictures during that celebration, but I carry mine in my head; of women carrying more chairs to the community hall to accommodate overflow crowds, of a man with a shovel uncovering gravestones and a rancher’s plane sitting in a meadow near the marker. Of people walking half a mile back to their cars after the ceremony because of limited parking at the highway site, and children from a nearby school eating sack lunches brought along on the field trip. DeWitty is gone, and Brownlee nearly so, but the spirit of neighborliness is not. There are memories of moments less proud in the minds of descendants on both sides, but healing is possible, and the marker celebration is proof of that. A group of locals leaned on parked vehicles outside the Brownlee community hall and visited while waiting for the room to go in and eat. A thought came to me as we stood there, and as we drove away. It lingers now, as I look back on the event. Descendants of the largest African-American settlement in Nebraska, located in the Sand Hills are expected to arrive in Cherry County on April 11 to celebrate the unveiling of a historical marker on U.S. Highway 83. DeWitty, also known as Audacious, was a series of homesteads scattered along the North Loup River west of the present-day town of Brownlee, Nebraska, and lasted from about 1906 until the last of the homesteads sold in 1956. The Nebraska State Historical Society marker is erected on Hwy 83 just south of the Brownlee turnoff. The dedication ceremony is slated to take place at 10 a.m., Monday, April 11th at the marker site. The public is welcome to attend. “So far, descendants are coming from as far away as California, Kansas, Florida, Delaware, and Virginia. Descendants of the town’s first postmaster, Jim DeWitty, are expected to come from Oklahoma. Other descendants of the DeWitty and Brownlee communities may attend from Valentine, Omaha, Colorado and the Minneapolis-St. Paul areas” said, Stew Magnuson, author of the book, The Last American Highway: A Journey Through Time Down U.S. Route 83, which has a chapter about the settlement. Stew has spearheaded the drive for the Historical marker and the installation ceremony. After the ceremony, Humanities Nebraska lecturer Vicki Harris will give a presentation about DeWitty at the Brownlee Community Hall, which will be followed by a potluck lunch. “There are not many residents left in Brownlee and the surrounding ranches, (the two communities were very tight back in the day) but they are going all out to welcome the DeWitty descendants and the other celebrants,” says Magnuson. “I am glad that the marker mentions the close bond between the black settlers of DeWitty and the white residents of Brownlee. The two communities were both isolated and on their own in the depths of Sand Hills back then. Here we have the story of a mixed-race couple, integrated schools, neighbors helping each other when they needed it, and two communities coming together to celebrate the quintessential American holiday, Independence Day. This should be remembered,” says Magnuson. Speakers at the ceremony will include a Cherry County Historical Society representative, Magnuson, Catherine Meehan Blount, a granddaughter of Charles and Hester Meehan – an interracial couple, who were among the early DeWitty settlers. Also, Joyceann Gray, a Granddaughter of William Roy,rancher and one of the orignial DeWitty settlers and wife Goldie Walker Hayes, legendary Principle, who remained in the county working in four-room schoolhouses long after the settlement disappeared. The Reverend Khadijah Matin, also a granddaughter of the Hayes’ will offer the invocation. 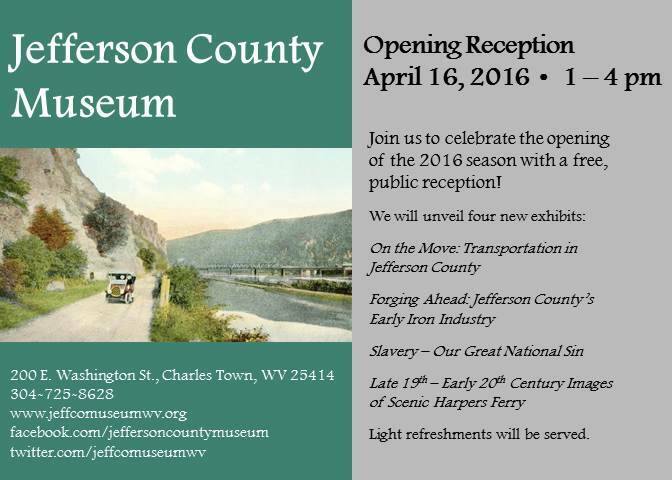 Charles Town Jefferson County Museum Opening soon! The Museum has included our families stories and this is exciting times to be sure, to have our ancestor’s legacies documented and remembered. There are direct links available to our web pages telling our family stories! Just click here and you will go directly to the story of the Hatters journey! The Ceremony is upon us! Historical Marker for DeWitty is installed.in remembrance of Nebraska’s largest and most well-known African-American rural community, off U.S. Highway 83 near Brownlee. DeWitty was the town that had the audacity to think they could, and so they did. Although the town didn’t survive and most of the land reclaimed itself, the legacy of those who came is evident by the descendants who will stand with us Monday, April 11. The driving force behind every plow, every nail driven, every sod wall built was with one purpose in mind. Not to build a lasting farming town but to be the stepping stone for their children’s futures. Each family ensured that education both religious and academic teaching were primary and the support to choose their direction was indeed encouraged for they were taught to believe they could grasp whatever star they reached for. Freedom to seek out adventure that beckons the bright and spirited minds. Just south of Brownlee turnoff, Highway 83 – we the descendants, neighbors, and friends will come together and shall honor the hard work of our ancestors, their drive, devotion, and visions. Remembering DeWitty pays homage to those who confronted racial barriers in the pre-civil war of United States, in Canada and in the Nebraska Sand Hills with a ‘we can overcome’ attitude. Remembering DeWitty gives anyone who knows their story a reminder that they can, too.” Contrary to various accountings for the reason of the demise of this town, DeWitty renamed Audacious centered their energies, visions, and struggles to achieve the American dream. They achieved their mission, and this is a fitting memorial for all their struggles. So by chance you can come and plan to share at 10 am, April 11, 2016, please do; for after the ceremony, there is a planned potluck luncheon by the folks of Brownlee in the Community Center for all to meet and greet.